I fell in love with Emily Carroll's work when I first discovered Through the Woods last summer. Her fairy tale with a twist short stories are deliciously dark, and they have just the right playful or romantic elements in just the right places. I've been eagerly looking forward to a new book from her, and this one is, sort of. 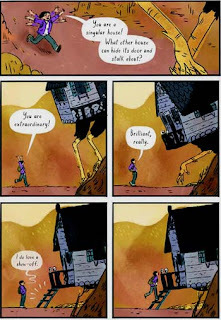 Baba Yaga's Assistant is written by Marika McCoola, and Emily Carroll's fantastic illustrations bring the story to life. Masha is a lonely teen who misses her grandmother, the only mother figure in her life since her mother has long since passed away. When her distant father begins a relationship with a new woman with a bratty daughter, Masha flees home and decides to become Baba Yaga's assistant. Baba Yaga tests Masha, both mentally and magically. Masha is able to rely on her own wit and knack for magic, in addition to the stories that her grandmother told her to prove that she has what it takes to be Baba Yaga's next assistant. But when the darker stories about Baba Yaga prove to be true, Masha will have to figure out a way to not only pass her tests, but outsmart her altogether. 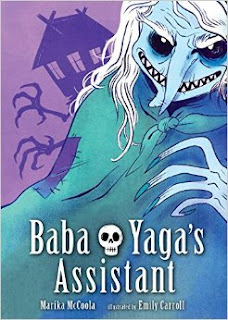 I really enjoyed the many different incarnations of Baba Yaga, and how McCoola incorporated many stories about her character within the narrative. Baba Yaga may remain somewhat of an enigma, but we learn a lot about Masha from her determination and sensible approach to dealing with Baba Yaga's pranks and tricks. Carroll's colorful artwork does a wonderful job at capturing both the playful and dangerous sides of the Baba Yaga myths, and the desperation that Masha feels when she leaves home. I only hope that there are more tales about Masha in the future, because I was very sad when this book ended! Always glad to hear about new graphic novels.